I took the road less traveled by… and got lost. The plan for the 30th of November was to first have breakfast at Ayala Triangle, then go to The Myth of the Human Body Exhibit, leave by lunch time, grab a quick bite, and then watch The Adventures of Tin-Tin at Greenbelt 3. Simple enough, but Fate did not allow it. On the evening of 29th November, E had a sore throat. And by morning the next day, he had a fever. He had a hard time getting out of bed, let alone out of the house. So, plans were cancelled. And of course, I had to be my difficult self and I complained to no end about how he always gets sick when we’re supposed to meet each other. I wasn’t blaming him. I was just disappointed at the world again, for making me all excited about my plans, and then changing the circumstances. Meet you tomorrow at ATC about 3pm sharp. Again? I thought, and thought that there was no way I was going through with Plan C. I was still sleepy! And the change in the plan was not a small one, it was one that required me to take a jeep, a bus, and the MRT. I almost wasn’t going to, but I figured I had to make an effort, too. Instead, I found E at the MRT station, carrying the biggest teddy bear I’d ever seen. We rode a bus, a jeep, and a tricycle, with said biggest teddy bear ever. We watched an episode of Firefly on TV (it was Ariel, and I made E watch it because he’s never watched Firefly before. IKR. ), and then after a quick late lunch at KFC, we saw The Adventures of Tin-Tin at the IMAX theater in SM Southmall, which in my opinion has so much better 3d facilities than the Greenbelt 3 3d cinema. So. OK. Planning is great, but sometimes, it’s all right when things don’t go according to plan. 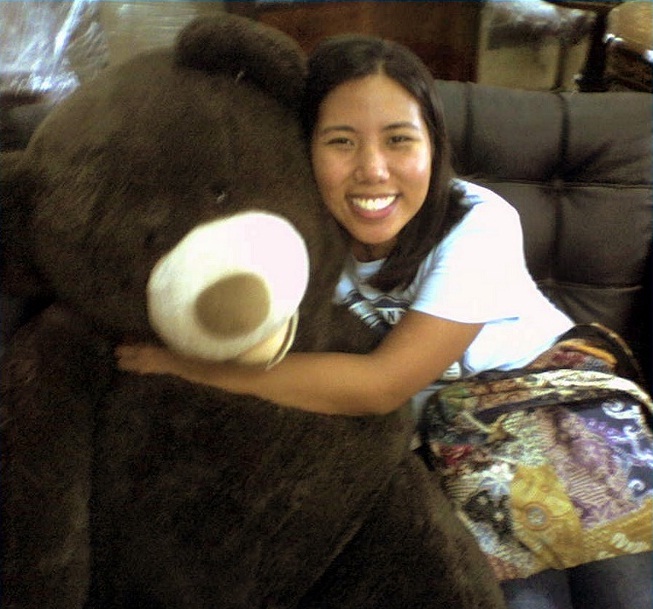 Sometimes you get breakfast at Ayala Triangle, and sometimes you get teddy bears that are larger than yourself. Such is life. And you know, it’s not too bad. best friend ba ang gumagawa nyan? weird that i somehow expected you’d post a picture of the bear sa dulo.. hehehe. asan na nga ba ang bear?? I was going to! ‘Yun lang, ‘dun ko sa kabilang blog nailagay ahehe. Pero eto picture!